A 37-year-old builder who strangled his former girlfriend in a lay-by has been sentenced to life in prison. 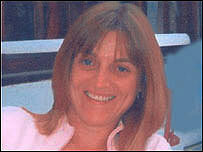 Richard Edward Philp of Edinburgh Drive, Spalding, Lincolnshire, admitted killing Debbie Newton, 34, from Hogsthorpe, on 7 June 2005. He will serve a minimum of 12 and half years in prison for the murder of the widowed mother of two children. Miss Newton's body was discovered in a dyke close to a lay-by on the A16 at East Keal. She had been in a relationship with Philp following the death of her husband, Jamie, from cancer in November 2000. Passing sentence at Lincoln Crown Court, Judge John Milmo said Philp's behaviour as "callous". The court heard that Philp, a builder with a child of his own, had moved in with Miss Newton and her two children at their cottage in Hogsthorpe, near Skegness, in 2002. Prosecutor Nicholas Dean QC said he was known to be a "controlling and possessive man who was self-centred and self-absorbed". Mr Dean said Philp was "distraught" when Miss Newton ended their relationship in summer 2005 and lured his unsuspecting ex-partner to the lay-by. After the murder, Philp returned to his flat where he wrote what the QC described as a "self-indulgent" suicide note, making no mention of his crime, before taking an overdose of pills which did not kill him. Mr Dean said the prosecution accepted that Philp - who admitted his guilt on the day he was due to stand trial for murder - had not planned to kill Miss Newton. Jeffrey Pegden, defending, said Philp had no recollection of the murder but was "deeply sorry" for what he had done. Det Supt Nick Howard, senior investigating officer, said: "I would like to pay tribute to Debbie's family who have maintained the utmost dignity throughout the investigation. "Their loss is so great and the only solace is that now they may be able to begin the painful journey of rebuilding their lives."